Dogwood trees in the American south are some of the early signs of spring and one of the things I missed about my home in Georgia when I moved to the UK. I had no idea they grew in Cornwall as my first spring here came and went without the unmistakable explosion of blooming color. We were well into a month I would normally associate with summer time when I discovered some gorgeous dogwood trees during a garden walk at Lanhydrock, one of my favorite National Trust properties. Noting my delight, my sweet husband John surprised me with one on a birthday trip later that year. My dogwood has been growing in a pot outside since we brought it home, living through the building extension, waiting to be planted in a place in the garden where I might see it from my desk as I write. 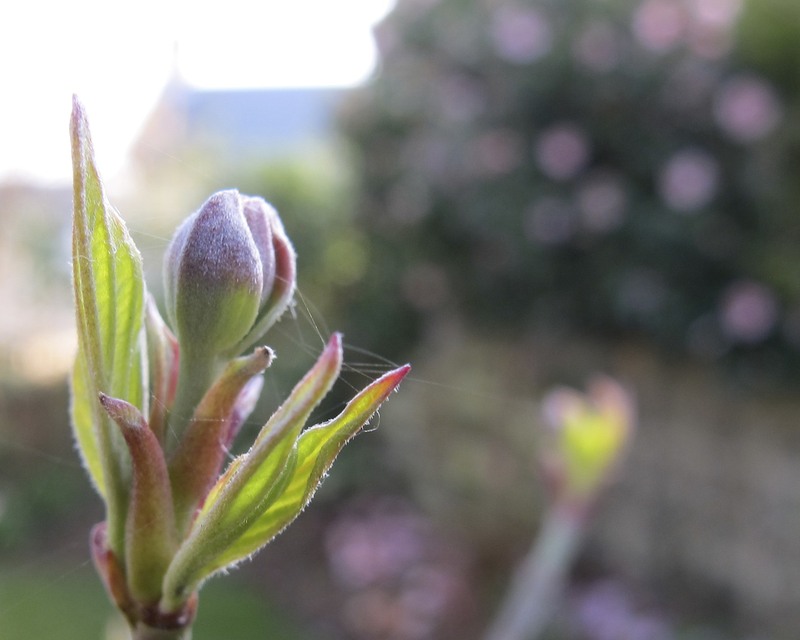 Last winter, Cornwall was blasted with freezing temperatures unusual for this part of England and I worried all the way from New Zealand where we were on an extended holiday, that it might die from the cold sitting outside in its container. A few days ago, John gently cleaned my little tree of all the dead leaves still clinging to its branches and noted as he did so that it had new leaves. I was thrilled to hear this as I had not held out much hope as poorly as it looked a few weeks ago. I have to thank Mary for her words and beautiful images this morning. 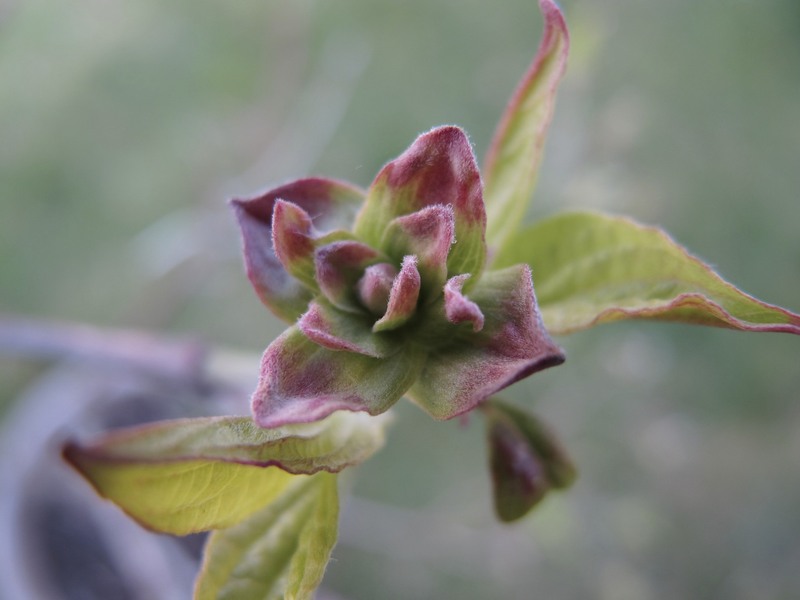 Seeing her dogwood trees in flower made me take a closer look at my special tree. 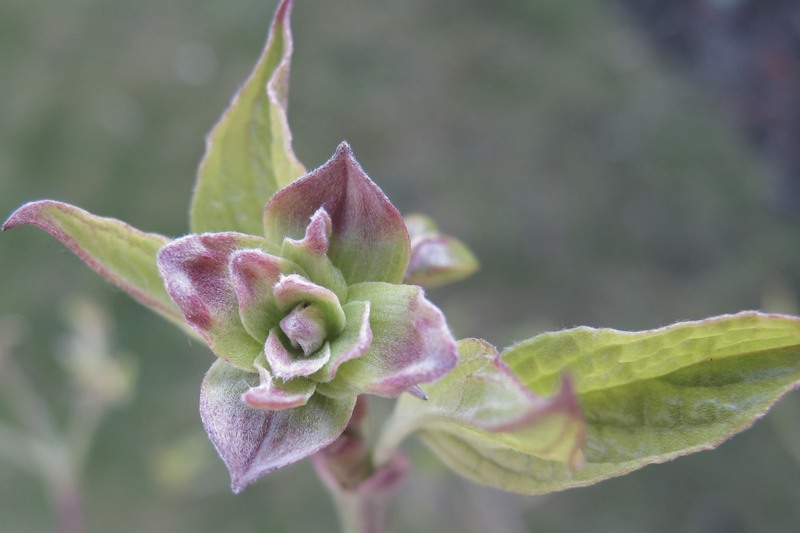 While my tiny dogwood is not in full bloom yet, it looks as if it may have flowers for the very first time later this year. If you click twice on these photos, you can see some texture that reminds me of the fuzzy softness of a newborn lamb’s ears. * The burgundy colored robe I’m wearing was my dad’s and has kept me warm on many cold mornings in the twenty years since his death. 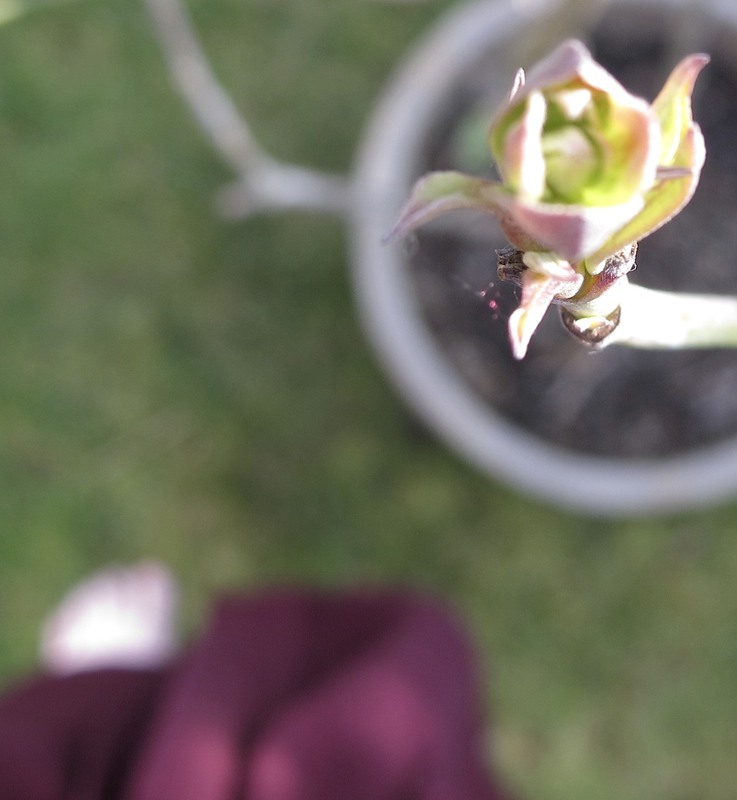 There’s something kind of special about seeing it sneak into my dogwood picture along with my barefoot completely unnoticed by me until I downloaded the image. I’m usually pretty aware of what else might be happening when I shoot and was pleased to see this one got past me. This entry was posted in Bloggers, Cornwall, Family, Living in UK, Love, Memories, Photography, Travel and tagged A Breath of Fresh Air, Cornwall, Dogwood Trees, Elizabeth Harper, Gene Harper, Georgia, Gifts Of The Journey, John Winchurch, Lanhydrock, National Trust Properties, New Zealand. Bookmark the permalink. Wish I could box up some of our spring and send it over there! I’m itching to plant my garden but I have to wait until my son can help me. So glad you have such a lovely tree! Sitting in my breakfast room in Augusta, Georgia enjoying a beautiful spring. The dogwoods are spectacular this year. Augusta is as beautiful as the the Masters TV coverage shows. But do you remember the pollen?? That is one downside to all this beauty. I was in Cornwall last October and it was beautiful. I love your blog. 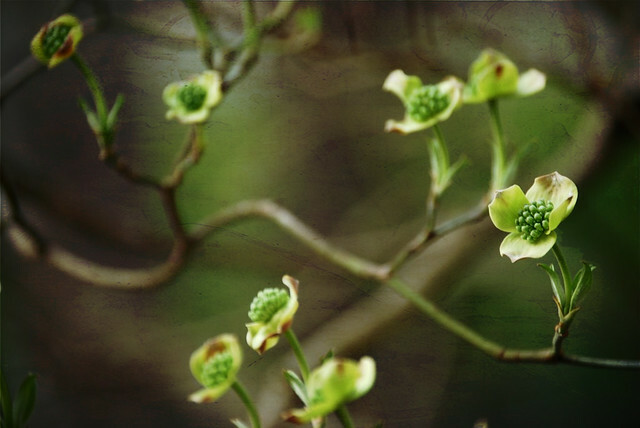 i’ve been taking a lot of dogwood photos myself -watching every day as the one outside my window opens up in full bloom. it’s always my favorite tree to watch. Seattle springs are very colorful, and very early — I start seeing forsythia and crocuses (and dandelions!) as early as the end of January or beginning of February. What I miss from my childhood? Picking peas and strawberries. If it were a very early, warm spring we could be doing both in May. I associate those foods with springtime. There are “u-pick” places in the area, but they’re too far away from the city for car-less me to access. Sigh. Thank you for the link Elizabeth – I just know that your heart must ache a wee bit for our southern Spring blossoms. We are fortunate to have such beautiful Springs here, BUT not the heavy pollen………it’s already visible on my white car, and I feel itching in my eyes and nose!! Your dogwood is very special, don’t think I’ve seen that variety with colorful petals – so glad it made it through your very cold Winter. How lovely that you still have your Dad’s robe…..I’m outside in mine these bright, crisp mornings too…..the garden draws me, so coffee in hand and camera around neck, I’m out the door early! Did you receive my e-mail with our Devon visit dates? P.S. Again, just have to tell you how much I LOVE Doc Martin – still watching as there are a lot of episodes. Loving the little feetie peeking out from below the robe. ‘Elizabeths’ twisted willow is moving from it’s large pot this weekend into a main bed in the garden… Lovely pics. I like the little bit of “you” that snuck into your last photo too!